I'm getting my Lil' Dude trailer sand blasted and painted. It only has one tail light with a bracket that holds the license plate. California law requires two tail lights. What have other people done about tail lights? Scrounge up some vintage lights? Go to Pep Boys and buy some new ones? Any suggestions? Please Log in to join the conversation. I replaced mine with LED's and I'm very happy. I'll check those out. Found cool lights on ebay, but big bucks and rough shape. Gotta draw the line somewhere. I did replace mine with LED's as well, but I know some of the folks like to stay as original as possible. There are even LED bulbs now that will screw into the original style bases, but I prefer the sealed units = less headaches on the road IMHO. I think it is way better to put two tailights on the back. But you may not have to if you really do not want to. Not sure what your state laws are but here (Minnesota) if the trailer only had one tail lite when new that's all you have to have when restored. 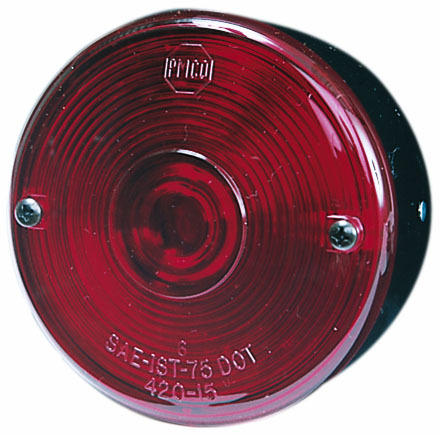 Most any truck stop or place that sells trailer parts will have the round tail lites like what was most likely on your trailer. Yours would have been metal and the new ones will be plastic but it is very hard to tell them apart. I am having the old original light and license plate bracket sand blasted with the trailer. Will probably find another oldie to sorta match so I can have a pair. I've got a few laying around the garage Mike, post a pic of what you're trying to match up and maybe I can help? Thanks Mark, I'll do that when I get my parts back frm the sand blaster. Why not restore the trailer with one light and use a magnetic tow light kit for operation? I've got a set of those too unclbuz, they're great for picking up "new" project trailers or as an emergency kit to get home - but I wouldn't use them on a regular basis. I'm afraid the magnets would scratch up a nicely painted trailer, and they're very prone to theft if you park somewhere! If I've got something you can use Mike you can have it for whatever it costs to mail it to you.